Therefor the tool of the day is... *drum roll* JSLint! JSLint provides tons of options to set the validator to your wishes. You can determine how strict the validation should be. By default, it's really strict so be prepared. On the website it actually says: "Warning: JSLint will hurt your feelings." and believe me, it will! 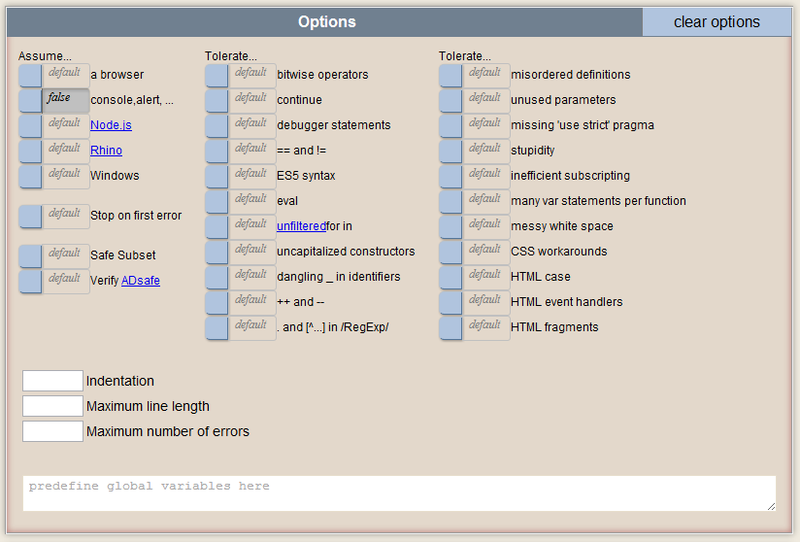 Below the input field you can find a set of options you can define for the validator. You can find a list of what is assumed and tolerated by default. You can see there are a lot of options about use of spaces/indentations, unused parameters, 'stupidity', undefined console/alert variables, usage of == and != ... . You can also predefine global variables here. You can find more information about all of these options on http://www.jslint.com/lint.html.